One of the most significant stops the Lewis and Clark Expedition made on its entire journey was along a small “fine bould and clear runing stream” in what is now western Montana – a site named “Traveler's Rest” by Captain Lewis. Twice they encamped there, once in September of 1805 on the outbound journey and again in late June and early July of 1806 on the return trip. Both times their encampment at this long-time crossroads of Native American travelers, now known as the Lolo Trail, was important to the Corps of Discovery's ability to proceed on and, consequently, Traveler's Rest is one of the most famous and widely known of their encampments. 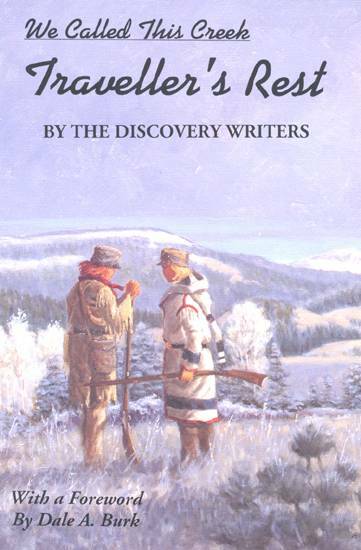 The site is, in fact, now a National Historical Site and a Montana State Park and this book tells the gripping story of not only what occurred there and nearby in regard to Traveler's Rest in 1805-6, but also the drama behind it becoming only second place along the entire Expedition route where scientific documentation revealed physical evidence left by members of the Corps of Discovery. This beautiful book contains 10 chapters, more than 70 photographs, an eight-page color section, numerous illustrations and a Foreword by Dale A. Burk. A stunning oil painting by Helena artist Robert F. Morgan showing Captains Meriwether Lewis and William Clark at the encampment site titled “We Called This Creek Traveller's Rest” graces the book's cover. This is the third book by The Discovery Writers, five ladies out of Stevensville, Montana – Jean Clary, Patricia Hastings, Diann Ladd, Jeanne O'Neill and Riga Winthrop. 6x9 format, 192 pages.